We’re getting closer to the holidays and that means we’re getting pretty festive around here! I thought today’s post would be a nice sneak peak into the upcoming Edible Gift Guide post. 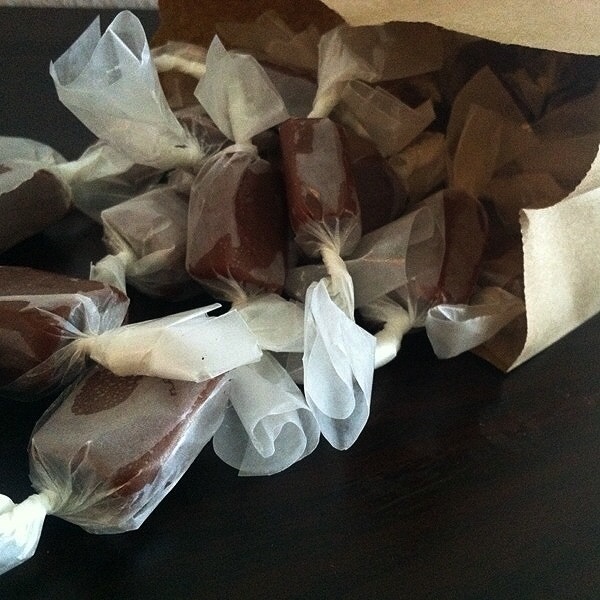 I really love giving gifts that are handmade and while they are usually sweets I do try to switch it up sometimes and make other things, but since this is a food blog we’re going to stick with the edible aspect. 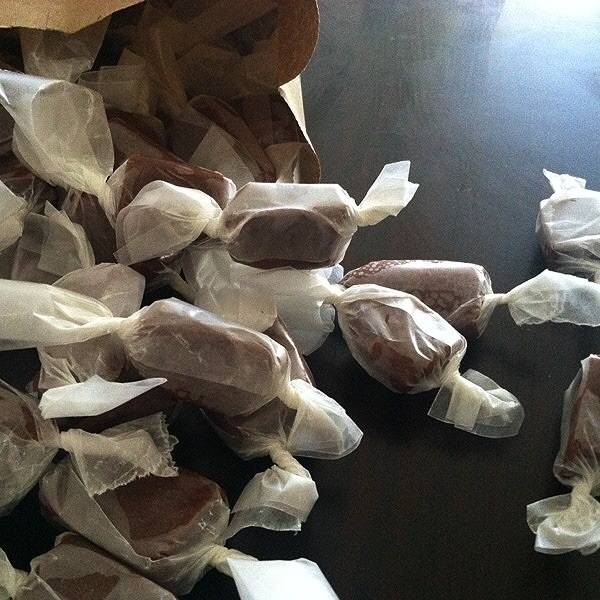 Behind the Scenes (BTS) : I wanted this candy to be a more on the adult side with adult flavors and an adult flair. 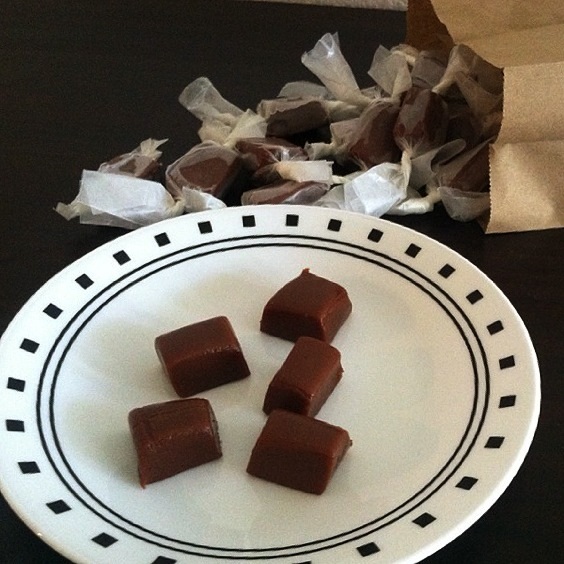 Whenever I make caramels I never wrap them, I just put them in a Tupperware container and let the house members get at them, but since these specific candies are gifts I figured I’d finally give wrapping them a go. I tried once with plastic wrap and as you can guess it didn’t look as nice and was a pain in my tiny hiney since it kept getting stuck to things, then I tried with parchment paper, that wasn’t too bad but it really refused to stay tied and parchment paper while not expensive isn’t cheap enough for me to continue to cut 500 squares to wrap them. This time I tried wax paper and it was perfect, why I didn’t try this earlier I will never know, but it ended up looking just like it was from a candy shop! Which of course I loved! 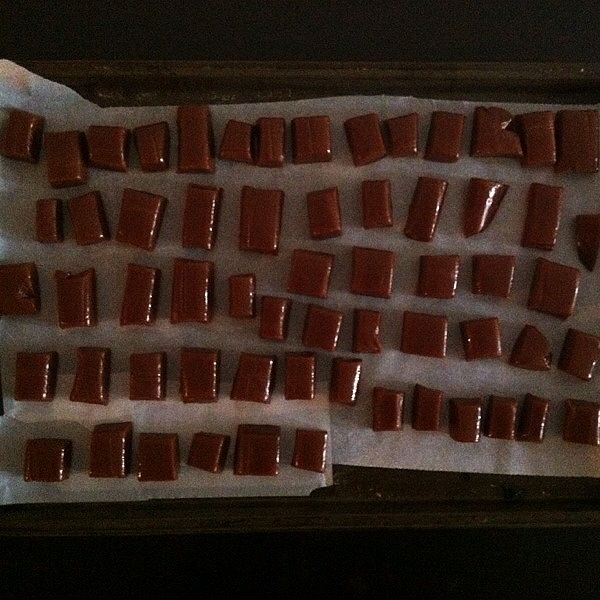 In terms of the candy, I used Liddabit Sweets recipe from their cookbook, (if you follow this blog you would have remembered a post about their Caramel Corn earlier). 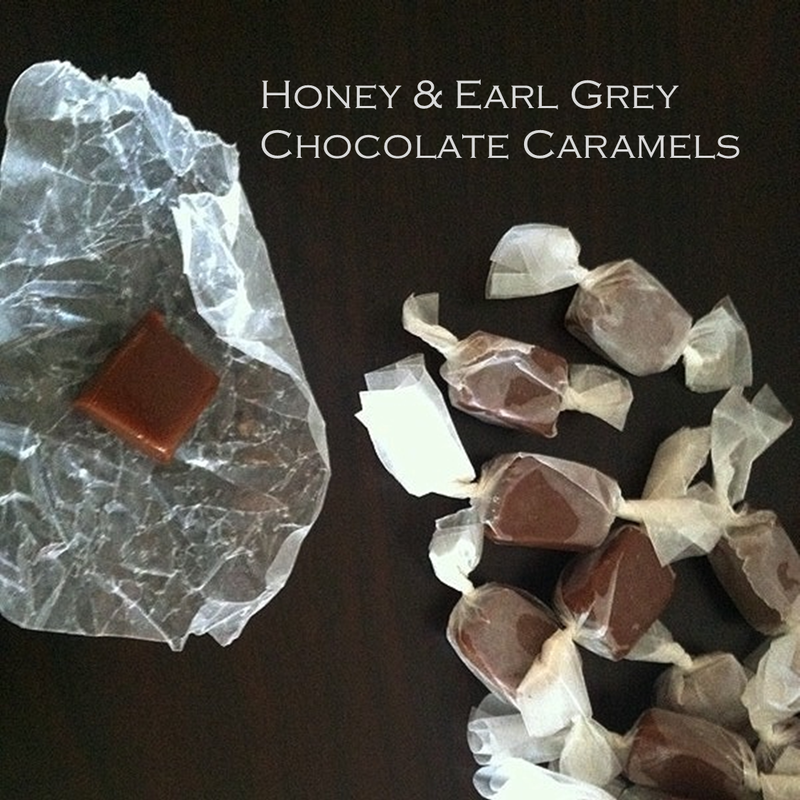 It’s actually simply a chocolate caramel recipe but I wanted to tweak it a bit, I chose honey because honey is a great substitute for corn syrup and whenever I read a recipe with a lot of corn syrup I try to find other ways around it. 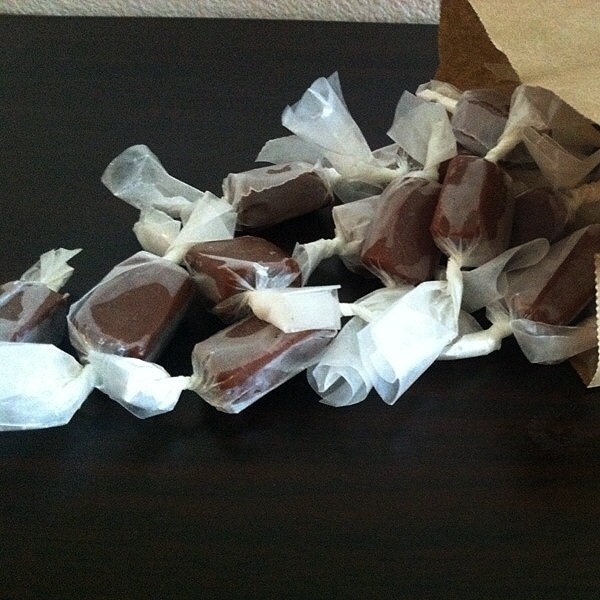 I love the honey taste it gives and it complements the chocolate perfectly. If your wondering about the Earl Grey flavor – my roommate had tea she knew she would never use and asked me if I would use it, I immediately knew which one I was using and for what recipe. It took a couple tea bags to get the flavor and I strongly suggest if you want a strong flavor of Earl Grey then use 5 teabags instead of the 3 recommended in the recipe. I knew the Earl Grey and chocolate would go well together not because of my personal taste preferences but because I saw a Earl Grey Tea Ice Cream with Chocolate Shards on an episode of Unique Sweets and it just sounded divine! Adjustments: I usually make some adjustments to recipes I find elsewhere because I know what I do like and what I don’t. The main and really only adjustment I made was to the corn syrup. I’ve noticed the older I get the less I use it. I know it’s weird but I feel like there’s no way in the devil’s homeland that your body can process the corn syrup so I swapped it out with honey and besides the tea the other adjustment I made was cooking the caramel to 240F/115.5C rather than the 238F/115C degrees the recipe called for. 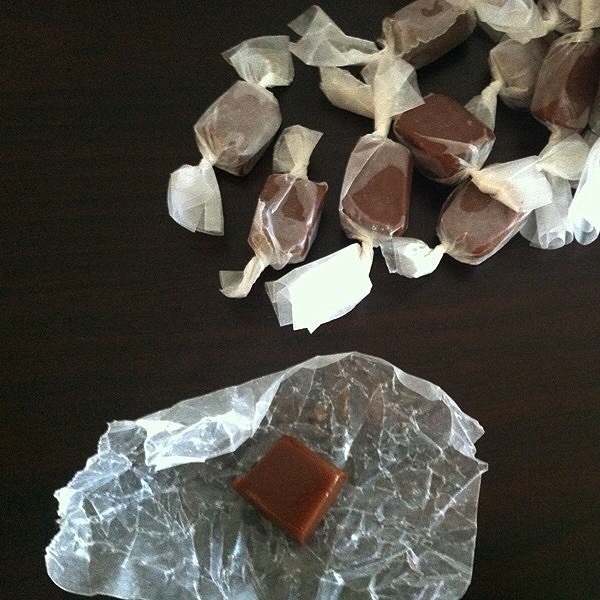 I know it doesn’t seem like much but it did make the caramel much thicker and sturdier but still chewy and edible. Overall: Overall I think this recipe is great for adults and giant kids who want to be adults. (Kids nowadays have such a adult flavor pallete than I did even in my late teens) I love the recipe from Liddabit Sweets and I love the tweaks you can easily make to their recipes. This candy makes for a great stocking stuffer for friends or candy at a get-together to show off your skills. 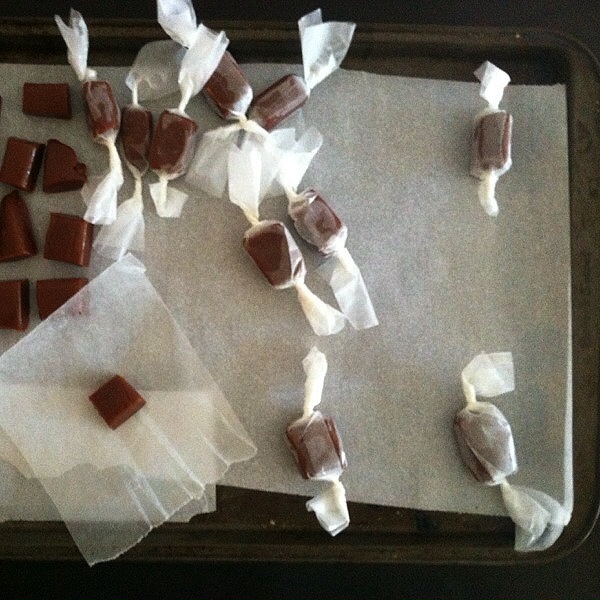 You’ll see below there are really only 5 steps to this caramel which shows it’s really easy. Ta-Ta-For-Now: Well as with the holidays approaching quickly I’m sure most of you all want to get out there and do your holiday shopping. I rarely do as I order mine online because I hate packed places where people are angry when they should be cheerful. I swear there are a lot more adults on the naughty list than kids. Don’t forget to make this recipe! 1. Measure out all of your ingredients. In the medium sauce pan heat your evaporate milk and heavy cream to a simmer; once hot add your tea bag and let it stay on the stove but turn the stove off. Let it steep for about 15 minutes. Take the teabags out of the milk mixture and combine the sugar, chocolate, evaporated milk, and heavy cream into the sauce pan and cook it to a boil over medium high heat, stirring to not let the bottom burn. Add the corn syrup and once melted in add the thermometer to the sauce pan. 2. Cook to 230°F/110°C which will take about 30 minutes over medium heat, and add the butter to the caramel mixture, and continue to cook it to 240°F/115.5°C which will be about 15 to 20 minutes time over medium low heat, and don’t forget to stir frequently. 3. Take the sauce pan off the heat, stir in the salt and pour it into your pan lined with parchment paper. I know you’re wondering if you should grease the pan and the answer is no, as long as the caramel is on the parchment paper there is no need to grease the pan. 4. Let it stand for 3 hours to firm up. Cut into desired shape or squares and or you could let stand overnight in an off oven. 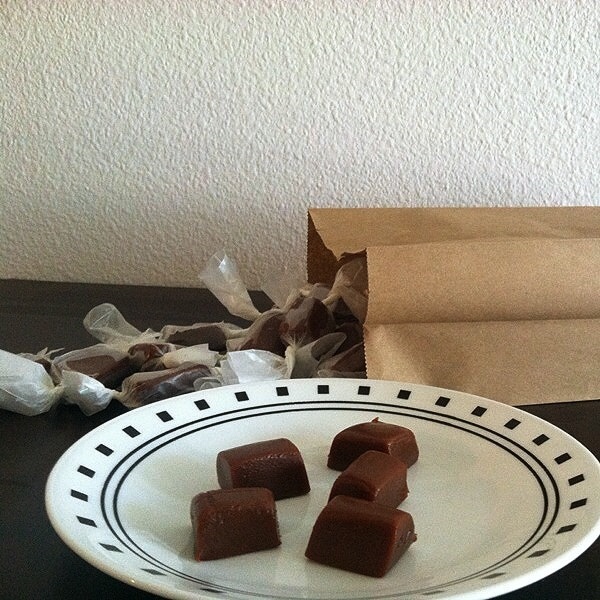 Wrap your cut caramels with the wax paper and twist the ends to get that adorable artisan look.